#LetsChalkShabbat is an innovative way to remind Jewish women and girls about this special weekly mitzvah. 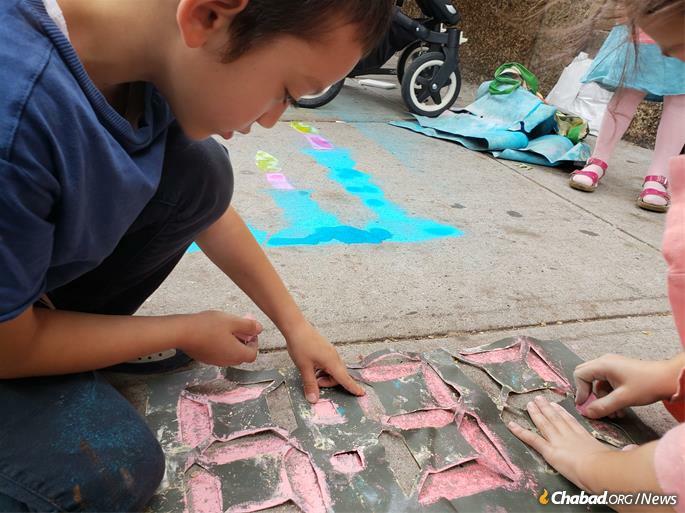 Every Friday, a dedicated group of women take to the streets with sidewalk chalk, stencils and Shabbat kits like on Manhattan's Upper West Side, above. It’s not easy to catch a New Yorker’s attention. Especially on a Friday afternoon. Especially in Manhattan. So when Chana Mushka Mishulovin wanted to spread awareness about Shabbat candle-lighting, she had to get creative. Enter #LetsChalkShabbat, an innovative way to remind Jewish women and girls about this special weekly mitzvah. 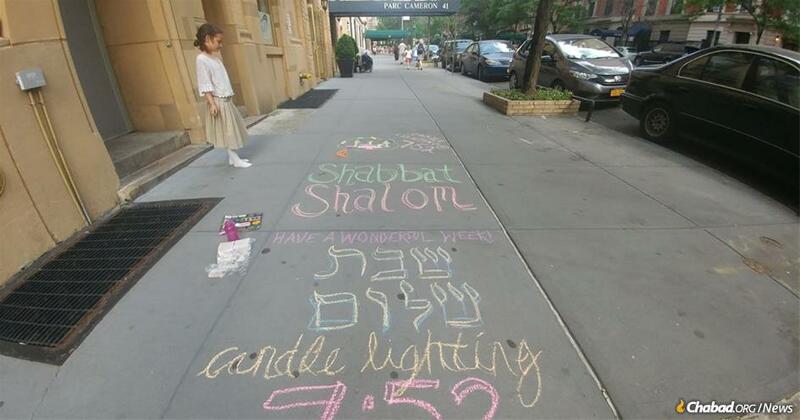 Every Friday, a dedicated group of girls and women take to the streets with sidewalk chalk, stencils and Shabbat kits. “We were overwhelmed by the number of Jews in the city,” Mishulovin, who founded the initiative, told Chabad.org. “I knew I couldn’t reach them all by myself, so I thought of an idea that could reach more people at their own pace.” The upbeat group of volunteers draw reminders to light candles on the concrete pavement, using stencils, colored spray chalk and sometimes even the good old-fashioned kind etched by hand to create pictures of candles and other Shabbat symbols. 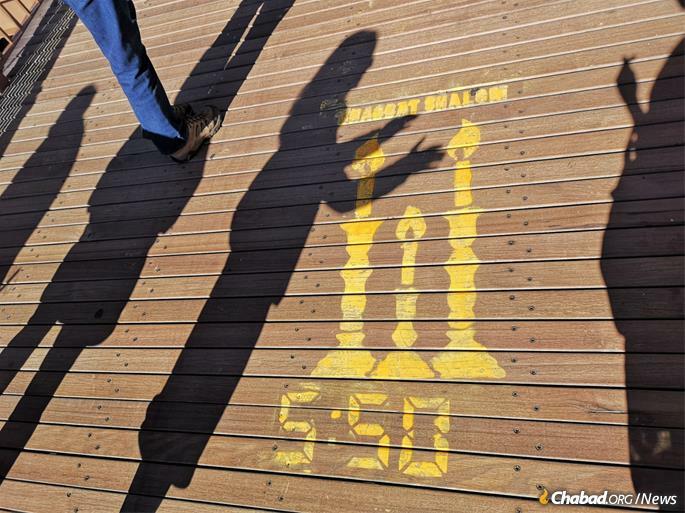 It began as a project of Chabad of the West Side, but quickly grew in size and scope. “We wanted to share the excitement we feel for spreading our message and encourage others to join,” said Fraida Warmflash, project director of #LetsChalkShabbat. Warmflash is the Mivtzoim Team Director-Women’s Division at Lubavitch Youth Organization, directed by Rabbi Shlomo Friedman. 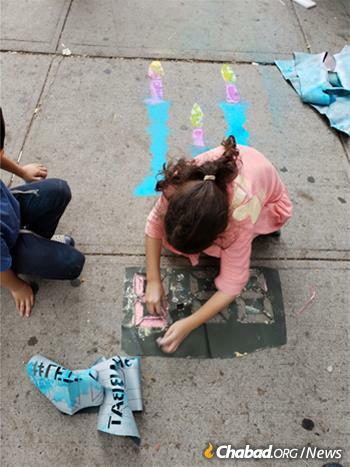 The organization supplies chalk and candle-lighting kits to dozens of volunteers each week, who share the message at subway stations, museums, tourist spots and schools. The organization supplies weekly chalk and candle-lighting kits to volunteers, who share the message at subway stations, museums, tourist spots and schools. The volunteers engage passersby, distributing Shabbat kits. The kits contain candles, matches and a short guide with the appropriate blessings in Hebrew, as well as translated and transliterated in English. The Lubavitcher Rebbe—Rabbi Menachem M. Schneerson, of righteous memory—encouraged all Jewish women and girls to light Shabbat and holiday candles, illuminating the world both literally and spiritually. This past summer, Warmflash assembled 200 #LetsChalkShabbat kits, distributing them to groups of girls on their way to summer camp to encourage them to spread the message. When they returned home, many continued chalking Shabbat in their hometowns. Donna Katz often gathers with a group of friends in Pittsburgh for an informal study group. She told her friends about #LetsChalkShabbat, encouraging them to join in spreading the light. One of the members of the group, Rivka Saks, was inspired to make a unique contribution. Saks received a $10 bill from the Rebbe 44 years ago and has treasured it ever since. Hoping to broaden the reach of the project, she has pledged to give the bill to whomever steps forward to make a contribution of at least $10,000 to the effort. Inspired by the Rebbe’s message, #LetsChalkShabbat continues to spread. Anyone can join; all it takes is some sidewalk chalk and a passion for lighting up the world. Contact info@letschalkshabbat.com to order a stencil kit. 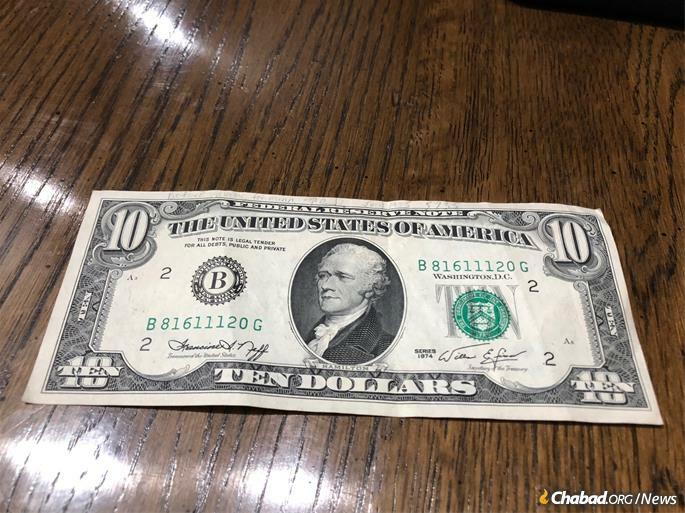 Rivka Saks of Pittsburgh received this $10 bill from the Rebbe 44 years ago and has treasured it ever since. Hoping to broaden the reach of the project, she has pledged to give the bill to whomever steps forward to make a contribution of at least $10,000 to the effort. Hey - that's me in the first picture in this article! I'm so proud of my big sister, Chana Mushkah Alevsky-Mishulovin for spreading light around the world in such an artistic way! 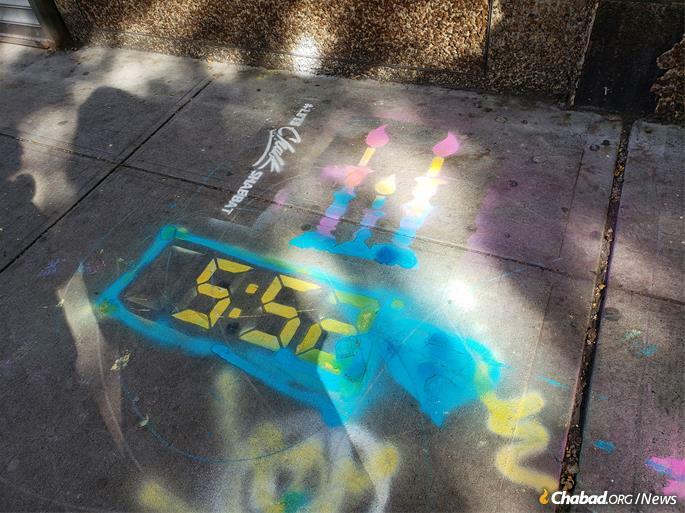 Now that she's married and moved out on Shlichus, to open Chabad of the South Bronx, I took her place and ChalkShabbat every Friday in front of our home. And you can do the same wherever you are. It's easy, fun and truly important!